Brandon is an accomplished outdoor writer & former TV host of the award-winning Bass Pro Shops Next Generation as seen on Outdoor Channel. He grew up on a small Wisconsin Dairy Farm where he learned firsthand what it means to be an honest steward of the land. His values are cultivated within the soil of trust, dependability & the passion to serve others. After graduating with an Advertising Degree at UW-Eau Claire, he built one of the largest Social Media Marketing Agencies in the outdoor industry. 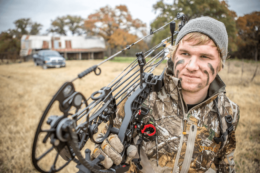 His passion for land and people marries a unique love for a career vested in the outdoors. If you are searching for an Agent who understands your needs, you’ll find Brandon to be your strongest asset. He’s a client-driven performance based motivator to get the job done right the first time. From utilizing trail cameras, aerial drones, building field maps and offering new-age land management advice, there’s not many Agents who go above and beyond to his extent. His robust approach offers clients a new state-of-the-art way to look at real estate in a different way. Whether it’s the perfect country home or hunting ground, you can rely on Brandon to make your dream a reality. Take one ride with him in his 6-passenger UTV looking at property and you’ll soon realize what separates your everyday Realtor from a Professional Land & Country Home Specialist. There are those who talk-the-talk. And those who walk-the-walk. My experience with Brandon Wikman was nothing short of incredible. I gave him my parameters of what I desire in a property and in a matter of days he had a lineup of tracts he thought would best fit me. We spent a number of weekends together walking property until I finally found my perfect piece. Extremely glad I contacted him. I wish that there were more agents like him that specialized in land and farms around the country. With Brandon, you know what you’re going to get. A highly motivated, hard working and trusting individual that will always put your needs in front of his. “Brandon Wikman helped me in the sale of my log home and 80-acres. My property was listed for a number of years with different Real Estate companies to no avail. I found Brandon online and reached out to him hoping to utilize a different angle. He was gracious enough to meet me the very same day to walk my land and look at my lodge. His firm knowledge of hunting and recreation ended up being the key to my sale. He showed up in boots, rather than a suit and got down to business. He took a much different approach than other Agents by showcasing my home and land for what it’s best fit for. And in under a few months, we SOLD it for asking price! The pictures he took were amazing. The Maps he created were detailed. His description of my property was on point. He just offers clients so much more. Not only is Brandon an expert in the business, but has become a lifelong friend. I highly recommend him to anyone buying or selling real estate.